Get to know more about Jovial Community Gardens, the newest addition at the 40 West Studios! For people not familiar with Jovial Gardens, can you provide a description of what the organization is and does? Jovial Concepts turns lawns into gardens and teaches folks how to grow their own food. 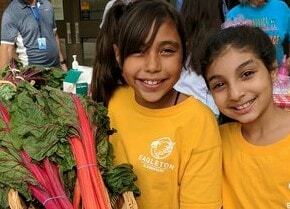 We use garden classrooms to nurture community, healthy living, and to forge a relationship with healthy eating. Our garden education is continued in the kitchen where we offer cooking, canning, freezing, nutrition, and budget based shopping classes. ·What are some top priorities of Jovial Gardens mission? To create full body wellness through activity, healthy eating, and community. ·Are there any opportunities for interested people to get more involved, such as volunteering? If so how might they find this information? www.jovialconcepts.org We love our volunteers and can often takes group as big as 100 on short notice. ·What are some future goals of the organization? We purchased a building at 1st and Sheridan just over a year ago. I think our current goal is completing the construction so that we have a hub for all our services and a welcoming community space. We are a bit over budget, so we have to meet some lofty fundraising goals this year. ·What are some interesting facts about Jovial Gardens Concepts that folks may not expect? Though we have a huge focus on food, we are all environmentalists. We deeply care about the soil quality, water quality, and leaving a healthy planet for future generations. We teach only organic and pesticide free gardening and incorporate native gardening and permaculture as much as possible. Can you tell us a bit more information about the project going on at the 40 West Studios? We have done two large raised garden beds that will also provide food to the 40 W. residents as well as neighboring food banks. During the summer months, we plan to incorporate some kids from the community to paint the garden bed with murals! We also hope to engage more 40 W. community members to help maintain the garden throughout the gardening season while providing gardening and sustainability education to all. We are also looking for other 40 W. members and residents to volunteer throughout the spring, summer, and fall.